CFA were retained by City Legacy Ltd to undertake the construction phase archaeological works for the £400 million Commonwealth Games Athletes Village contract. 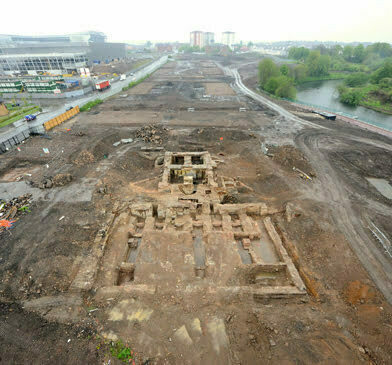 This involved around 6 months of open area excavation which involved careful planning between CFA Archaeology Ltd, Malcolm Construction and WSP Environmental Ltd, to ensure that archaeological works did not compromise the tight construction schedule. The first phase of excavation took place on the site of the Springfield Print and Dye Works, which were founded in Dalmarnock in 1826 by William Miller & Sons. The Works can be seen on the 1832 Parliamentary Reform Act Plan of Glasgow. 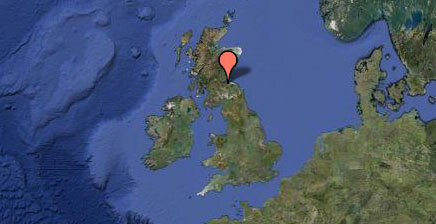 The dye-working industry thrived in Glasgow on the back of new technology, which included advancements in steam power. The Dye Works at Springfield were synonymous with the production of ‘Turkey Red’ dyed fabrics. The fabrics were expensive and time consuming to produce but were much sought after. Map evidence shows that by 1858 the works had grown rapidly due to this prosperity and in the period between 1858 and 1895 the works again were expanded. By 1912, the dye works had fallen into disuse, although the site continued to be used for other industrial works such as a tallow factory. 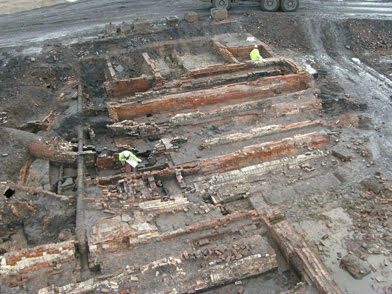 The excavations uncovered large parts of the Dye Works dating between 1858 and 1895. This included workshop areas, boiler houses, machine stances, working surfaces and underground flue and drainage systems. 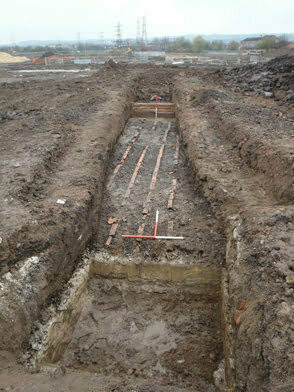 Sample excavation of the filtering ponds for the dye works also took place. 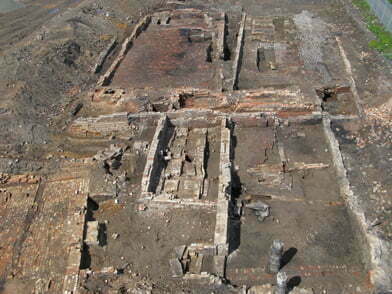 These had been badly damaged by the later redevelopment of the area but sufficient survived to identify that the filter ponds had been clay lined and filled with deposits of cinder and ash which contained rows of linear clay pipes; these pipes filtered the contaminated water from the works prior to it being discharged in to the River Clyde. 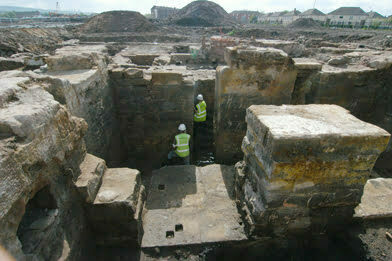 Extensive excavations also took place in the location of the former Glasgow Water Works. The first Glasgow Water Company’s Act was obtained in 1806 and work began on the first pump house in that year. The works were constructed under the advice of eminent engineers, James Watt and Thomas Telford. The company began to supply water early in 1809 and used Boulton and Watt beam engines to pump water from reservoirs situated on the Cunnigar Loop, under the River Clyde and into the waterworks, which then conveyed it to reservoirs in Sydney Street for eventual distribution. In order to keep up with demand a second pump house was built. The Company was taken over on 10 May 1857 as part of the Glasgow Corporation Waterworks Act of 1855, which led to the construction of the Loch Katrine Project. 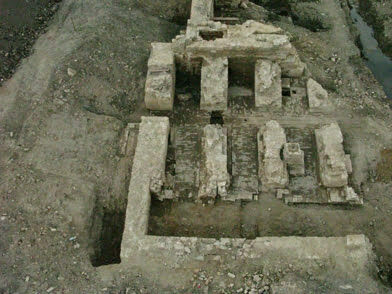 The remains of both pump houses were identified and excavated. The best preserved was the early pump house. Both pump houses had been massive structures with foundations around 2m thick. Both pump houses featured a boiler room, where the steam to power the pumps was created, and an engine room where the pumps would have been located. In the early pump house it could be clearly seen that the engine room was divided into a condenser end and a well end. The condenser end was where the condenser and cylinder were located and this is where the difference in atmospheric pressure was created that made the beam engine run. The well end was where the water was drawn from. The bottom of the well was not reached during our excavations but the infill from it was dug out to over 6m deep before it was decided to leave the remains of the well in place. Original accounts suggest it may have been have been about 10m deep. 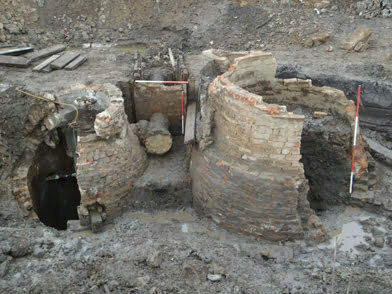 Whilst the later pump house was not as well preserved, it was possible to identify the separate boiler room and engine room. One of the more interesting parts of the excavation in this area was the identification of two deep brick-lined wells and a large-diameter cast iron water pipe that were located to the side of the pump house. The huge amount of later disturbance that had taken place since the works went out of use meant that there was no link between the wells and the pump house but we think they must have formed part of the water intake for this pump house. Other remains that were identified elsewhere within the site were the foundations of the 19th Century Springfield House that was once the home of the owners of the Dye Works.